Welcome to the Attitude Custom Painting Customer Lounge! Thank You for choosing Attitude Custom Painting to do your custom paint job. Jody and I hope you found this 'internet' experience to be a pleasure to you. We know how rough it could be to do a internet transaction with a company that possibly isn't even in the same state, let alone not even being able to visit.. So we go in great strides to make sure that our service and your internet experience with ACP was one that you are satisfied with. Our Krew takes great pride in our work! Once you set your set in person, you'll see our work shows better in person than in any pics we sent you. Below are a few links that might help you out. We also have a couple other links that help give you the ability to upload some pics of your bike to show it off. 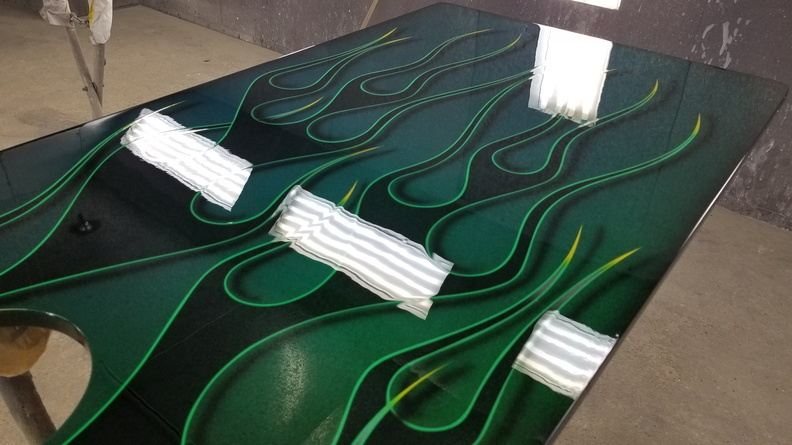 The ACP site get's more hits than any other custom painting site. 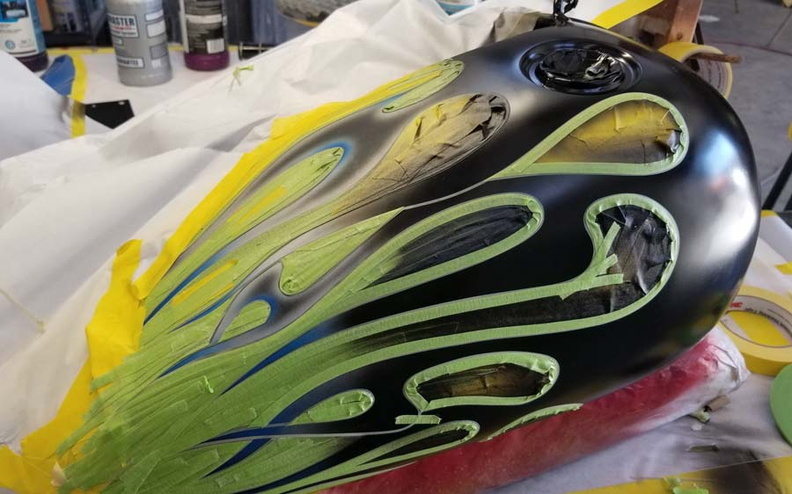 So if you would like to show off your bike along with your new paint job, the Customer Rides section is the place to do it. Simply email us some pics of your bike and we'll upload them in the our Customer Rides section. We'd love to show it off. Upon receipt of your set, you should also receive a 'Thank You' letter with some business cards in it. This letter also contains some basic care tips. For our customers that have freshly painted tins and paint that can be polished, you should also receive a small bottle of hand glaze. Be sure not to use wax for the first 30 days starting from the day we painted it, which for most customers, is 3-4 weeks after the set is received. Use a hand glaze during this time. After the 3-4 weeks, the paint has cured enough that a good grade wax can be used. If you don't read anything else, be sure and at least read this! First thing you need to do when you receive your set is to remove them from the boxes and packing material along with checking them over. You MUST report to us any damage ASAP. If someone else is unpacking them for you, then you will be responsible for letting them know this. If you have a complete paint job done by ACP (not a spot job), do be sure and look for a bottle of glaze that was packed with your set. Do use extreme care when removing the packing material from your tins. Do not use a sharp object to remove the packing material. We recommend that you do use a professional certified mechanic install your set. They have done this before and have the knowledge of how to install your set. If you decide to do the install, BE VERY CAREFUL! All threaded holes should be tapped before installing the bolts. If you get bird 'do-do' on your paint job, do not let it sit long. This will be sure to eat into your paint job. You can wash your bike anytime. Lot's of soap and water and a good wash mitt is fine. You should never dry wipe your paint as it can scratch or cause damage your paint. Please remember, Attitude Custom Painting is not responsible for the installation of your set. You are fully responsible for the complete installation. Remember, the paint is still very fresh and will scratch easily or stain or possibly even 'eat' the paint if you spill fuel on it. If we do the install, we will be responsible for the installation of your paint job. If you decide to install the set yourself, use good quality tools. All it takes is a wrench or a screwdriver slipping and it's all over. Do not wax your bike for 30 days. Do not let water sit on the paint job in the sun for an extended amount of time. This will be sure to leave droplet spots. The water droplets act as a magnifying glass and the edges of the droplets get extremely hot. Stretch and custom tank owners–Be sure and keep in eye on the area directly around the bung area. If you start seeing this area start lifting up, immediately take some clear fingernail polish and put a bead around the edge of the paint and bare metal area. We do everything we can to prevent this from happening by keeping the painted surface from the edge of the bung. We also put either a bead of sealer, tank sealant, or catalyzed paint around the edge of the paint. Be sure and also use new caps to help prevent the the fumes from reaching this area. If the fumes under the edge of this area, they *will* lift the edge of the actual paint job. So please keep an eye on this. We hope you enjoy your paint along with the service. If so, we'd love for you to submit a testimonial to the website. You just need to make sure you are registered to the ACP website. Then follow this link (you can also find this link under the "My Account" link on the navigation menu). You must be logged in to see the link. You can also upload a pic of your bike or we can upload a pic that we sent you of your paint job. You can come back and add a pic of add a link at anytime. If you have an interesting story or article you would like to submit to the ACP website, you can do so. Please be sure it's either auto or motorcycle related. This will end up on our home page as a 'teaser' (limit of 2 articles will show on the home page). A visitor must click on the link to see your full story. Other registered users will have the ability to comment on your story if they wish to do so. Most stock H-D's have a vinyl plastic sheeting over the paint to help keep the seat from rubbing into the paint. If you plan on putting one of these back on, you can get this at your local H-D dealer. They run about $15 each. If you have a newer H-D (2003 and up), you will notice that you have a 'sleeve' to hold the wiring into place instead of the rivets that held on clips on the previous years. Instead of taking each pin out of the connecter, you can cut a slice into the side of this sleeve and tuck the wires into the sleeve, THEN attach the sleeve onto the fenders. I found this MUCH easier to do instead of running the wires through the sleeve without the connector. I always face the cut side of the sleeve toward the outside corner of the fender. Also, if you have a bike that has the older style 'rivets' on the rear fender that holds the elect, and you order a rear fender from us, most likely you will NOT get a fender that has the rivets on it. You will most likely get the newer style fender that uses the elect. sleeve mentioned above. H-D used to supply these with the new fenders, but they no longer do this, so you will be responsible to supply your own wiring harness sleeve. Of course if you purchase a used fender from us, the same applies, you will be responsible for your own elect. sleeve. If you have pre-2000 aftermarket tanks, you will need to use the pre-1996 Harley-Davidson caps. The 1996-1999 caps will not work with these tanks. You will find that taking out the gauge may be quite a challenge to you. Don't get frustrated and just cut the wires!!! With a little patience you can get the wires out with a scratch awl. Open the little trap door on the end of the connector, and then from the other end of the connector (where the other side of the wiring harness connector goes into), you will see a very small hole above the pin. You will need to stick the awl into this hole and pull on the wire out the other end at that same time. If you get the awl to hit the right spot, the wire will slip out the other end. It's also a good idea to put a small piece of masking tape on the connector with the initial of the color wire that is in that slot. Some of them will have 2 wires, some 3. Some will also have an empty slot. Mens and womens shirts are available in our online store! Upon receiving your parts, be sure you take them out of the shipping materials and boxes immediately. This will help prevent any prints that the shipping material will leave. If you are having someone doing the installation for your, be sure and relay this info to them. If you have a flat, satin, or "Denim" style paint job, be very careful when installing your set. If it gets scratched, you cannot buff this out. Also be sure not to get fuel on it, as this is very fresh paint. Feel free to wash your new paint job with soap and water at anytime! When your bike gets 'dusty' ,never "dry wipe" your new paint job. Always use a good spray detailer or if you wash your bike, be sure and wipe the paint surface down with a good clean cotton cloth or a good chamois. For the first 3 weeks, use the glaze that we supplied you when you received your parts. After the 3 weeks, you can wax your paint job at anytime. I personally like "Meguiars NXT" wax. Before each riding season, you may want to find a local detail shop that can "foam pad" (not the same as buffing) your parts. This will get out any minor scratches that you may have gotten during the months of riding and bring them back to show quality. EFI owners- Be sure and use a new gasket when reinstalling your EFI pump. Be sure all bolts are properly tightened. Not doing this, will lead to fuel (or vapors) leaking on your fresh paint, and damaging it. Since the EFI pump is located under the dash, leaks from this area may go undetected for days, even weeks. Fuel sitting on fresh paint this long will surely damage your paint. Though we use the best paint systems available, there isn't any clearcoat paint made that is 100% impervious to fuel. If gasoline is spilled on your paint, be sure and immediately rinse off. 84-99 Stretch tank owners–Be sure and use '93 H-D caps (right and left hand H-D caps), as they use the older style threaded bungs for these tank. 96-99 will not caps will not fit. Before actually putting the tank on the bike, I would suggest running a little fuel in the tank to get rid of anything that may have gotten in your tank. Although, we do blow your tank out before shipping, it is recommended that you also rinse it out. Be sure and use a good grade wax on your new paint. You can start waxing after 30 days from the approximate day we painted it. I personally like Meguiars NXT wax (I like the paste better than the liquid). But this is all personal preference! Thank You for your business…Enjoy your new paint job! 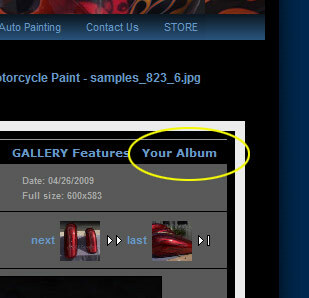 You can re-edit at anytime by clicking on that "My Albums" link or by clicking on the link found under the Gallery2 title in your Attitude Custom Painting "My Account" (you can also find the My Account link in the main menus found on most pages of the website. Free listings and listing upgrades for all our customers. To get this offer, you must put "acpcust" in the "Registration Code" when you register.